Have you noticed a musty odor in your home lately? Don't tolerate that nasty, damp smell. Contact a waterproofing specialist like Jerry's Waterproofing. Crawl spaces with high moisture levels are a perfect habitat for mold, insects, and airborne pollutants. Left untreated, mold and mildew can create an unpleasant odor that affects the air quality of your entire home. Chronic dirt, humidity, and structural issues are also signs of crawl space issues that need immediate attention. At Jerry's Waterproofing, we offer crawl space repair with crawl space encapsulation for wet, damp crawl spaces. This method involves the use of a vapor barrier installed into your crawl space to prevent water damage from occurring. Having a dry crawl space will not only prevent foundation problems, but it will also increase the longevity of your foundation for many years to come. If you have any of these issues, contact Jerry's Waterproofing today. We can inspect your crawl space to determine the source of your wet crawl space. We offer crawl space encapsulation to transform your moldy crawl space into a dry foundation. A vapor barrier liner covers the entire area of the crawl space, including the ground, walls, and concrete supports. A vapor barrier is made out of a puncture- and tear-resistant liner used to prevent evaporation of ground moisture, and keep water from entering through the ground and walls. Also, vapor barriers guard homes against harmful gases such as radon. We can combine a radon mitigation system with a vapor barrier to significantly lower radon levels. 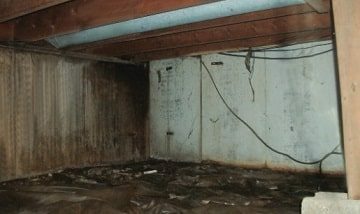 If installed with a waterproofing system, water can be removed from the crawl space before it leads to water damage. Jerry's Waterproofing provides excellent workmanship. We use appropriate materials and tools to keep your crawl space clean and dry. Contact us today if you need crawl space encapsulation in the Omaha, NE area. We provide free estimates!